1 Sound is a wave that is created by vibrating objects and propagated through a medium from one location to another. 2. A disturbance that travels through a medium, transporting energy from one location to another location is called wave. The medium is simply the material through which the disturbance is moving; it can be thought of as a series of interacting particles. 3. In our body Vocal cord is vibrating body that produce sound wave. 4. The sound wave is transported from one location to another by means of particle-to-particle interaction like air particles in air. 5. Air particles interact continuously throughout the entire medium that causes disturbance to its nearest neighbours till sound reach to listener. 6. A sound wave is a disturbance that is travel through a medium via the mechanism of particle-to-particle interaction. Hence sound wave is characterized as a mechanical wave. 7. Longitudinal waves are waves in which the particles of the medium propagate is in a direction that is parallel to the direction of energy transport. 8. Sound waves in air (and any fluid medium) are longitudinal waves because particles of the medium through which the sound is transported vibrate parallel to the direction that the sound wave move. 9. The back and forth vibration of the string causes individual air molecules These back and forth vibrations are imparted to adjacent neighbours by particle-to-particle interaction. Other surrounding particles begin to move rightward and leftward, thus sending a wave to the right. 12. The wavelength is commonly measured as the distance from one compression to the next adjacent compression or the distance from one rarefaction to the next adjacent rarefaction. 13. A sound wave consists of a repeating pattern of high-pressure and low-pressure regions moving through a medium, it is sometimes called pressure wave. 14. The particles of the medium through which the sound moves when vibrating a back and forth motion is called its frequency. 15. If a particle of air vibrate 100 times in 2 seconds, then the frequency of the wave would be 50 vibrations per second. Unit for frequency is the Hertz (abbreviated Hz). 19. Any sound with a frequency above the audible range of hearing (i.e., more than 20 000 Hz) is known as an ultrasound. 20. The sensation of a frequency is known as the pitch of a sound. 21. The time taken for one oscillation is called time period. 22. The amount of energy that is transported through a given area of the medium per unit of time is known as the intensity of the sound wave. Intensity is the energy/time/area or power/area. 23. Units for the intensity of a sound wave are Watts/meter2. 26. The loudness of sound depends upon the amplitude of vibration. If the amplitude is less the sound is feeble. If the amplitude is more the sound is loud. The unit of loudness is called decibel (dB). 27. 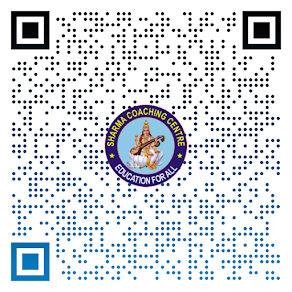 The pitch of sound depends upon the frequency of vibration. If the frequency is less the sound has low pitch. Eg :- sound of a drum, sound of an adult etc. If the frequency is more the sound has a high pitch. Eg :- sound of a whistle, sound of a baby etc. 29. The Human Ear consists of three basic parts - the outer ear, the middle ear, and the inner ear. 31. The middle ear is an air-filled cavity that consists of an eardrum and three tiny, interconnected bones - the hammer,anvil, and stirrup. 34. The movements of the eardrum will set the hammer, anvil, and stirrup into motion at the same frequency of the sound wave. 35. The inner ear consists of a cochlea, the semicircular canals, and the auditory nerve. 36. Cochlea converts sound wave frequency into electrical impulses. 37. The auditory nerve transfer electrical impulses towards the brain. 38. The brain is capable of interpreting the qualities of the sound upon reception of these electric nerve impulses. 39. Noise :- Unpleasant sounds are called noise. It is produced by irregular vibrations. Eg :- If all the students in a classroom speak together, a noise is produced. Sounds produced by horns of busses and trucks. 40. Musical sound :- Sound which is pleasing to the ears is called musical sound. It is produced by regular vibrations. Eg :- Sounds produced by musical instruments. Sound of a person singing a song.. How sound is produced? Answer: Sound is produced by the vibration of vibrating object. 2. What do you understand by a ‘wave’? Answer: A periodic disturbance created in material medium that transfer sound and light energy is called wave. 3. Write three differences between sound and light waves. Answer: sound wave is Mechanical wave that require material medium for propagation where as light waves are electromagnetic wave that can travel in vacuum. 4. What do you understand by “sound energy cannot be produced”? Answer: Sound energy cannot be produced on its own. Some mechanical energy is required to make an object vibrate. It is the mechanical energy of the vibrating object which travels through a medium and ultimately reaches the ear. 5. What is the name of the wave that can travel through vacuum? 6. Explain by some experiment that sound waves require medium for their propagation. Answer: An electric bell is suspended inside an airtight glass bell jar connected to a vacuum pump. As the electric bell circuit is completed, the sound is heard. Now if the air is slowly removed from the bell jar by using a vacuum pump, the intensity of sound goes on decreasing and finally no sound is heard when all the air is drawn out. We would be seeing the hammer striking the gong repeatedly. This clearly proves that sound requires a material for its propagation. 7. How sound waves travel through some medium? Answer: Sound waves work travel through some medium by passing vibrations from molecule to molecule. If there is no medium, then there no molecules to pass vibrations. 8. Why sound waves do not propagate through vacuum? Answer: If there is no medium, then there no molecules to pass vibrations. 9. What are the transverse waves? Give two examples. A wave in which the particles of the medium vibrate at right angles to the direction, in which the wave is moving, is called transverse wave. Example: Light waves. 10. What are longitudinal waves? Give two examples. A wave in which the particles of the medium vibrate back and forth in the same direction in which the wave is moving is called longitudinal wave. Example: sound waves. 11. Give two points of difference between longitudinal and transverse waves. (1)A transverse wave is a wave in which variation of the amplitude of a wave is perpendicular to the direction of propagation of wave. (2) Light wave, wave in string, wave developed in water etc. (3)In light wave electric and magnetic field oscillates normally to the direction of motion of the wave. (4) It may propagate in the vacuum. (1)A longitudinal wave is a wave in which variation of the amplitude of wave is in the direction of the propagation of wave. (2)sound wave, oscillation in the spring. (3) In spring wave elongation or compression occurs along the direction of motion of the wave. (4) It can not propagate in the vacuum. 12. How will you prove that the sound waves exhibit longitudinal behaviour? When the tuning fork vibrates in air, they force the particles of the air to vibrate back and forth by a small distance. While vibrating, when the prong moves to the right side, it sends out a compression and when the prong moves to the left, it produces a rarefraction in air. The longitudinal waves in series produce compressions and rarefractions in air from the tuning fork. These compressions and rarefractions of sound waves is formed by the vibrating particles causing vibration in the ears, the eardrum vibrates for reproduction of sound. 13. What are rarefaction and compression in case of sound waves? Answer: Compressions: Areas in the wave where the air molecules are pushed close together and so at a slightly higher pressure. Rarefaction: Areas in the wave where the air molecules are further apart and so at a slightly lower pressure. 14. Distinguish between crests and troughs. Answer: The highest point of a wave is known as its crest while the trough is the lowest point of the wave. Wavelength is the horizontal distance between successive crests or troughs. 15. Write the SI unit of velocity of a wave. 16. What are the factors that describe the sound wave and define them? 17 .Why is a thundering sound heard later than lightening? Answer: This because the speed of sond is much lesser than that of light. 18. Sound travels with different speeds in different media. Comment. Answer: Sound waves need to travel through a medium such as a solid, liquid, or gas. The sound waves move through each of these mediums by vibrating the molecules in the matter. The molecules in solids are packed very tightly. Liquids are not packed as tightly as solids. And gases are very loosely packed. The spacing of the molecules enables sound to travel much faster through a solid than a gas. Sound travels about four times faster and farther in water than it does in air. This is why whales can communicate over huge distances in the oceans. Sound waves travel about thirteen times faster in wood than air. They also travel faster on hotter days as the molecules bump into each other more often than when it is cold. 19. How far are a compression and its nearest rarefaction in a longitudinal wave? 21. What is the frequency range of sound for human beings? 22. What are the ultrasonic and supersonic waves? Answer: Ultrasonic waves refers to sound of frequencies greater than those that can be heard (usually frequencies above 20 kHz). Supersonic refers to sound of velocities faster than the speed of sound (in the medium under consideration). 23. What type of waves are produced by animals like bats and dolphins? 24. Explain two applications of ultra sound waves? Answer: Ultrasound is a wave with frequency greater than the upper limit of human hearing. These waves travel along well -defined paths and can even penetrate obstacles. a. It is used for medical diagnosis and therapy and also to clean parts located in hard-to-reach places, for example, spiral tube, electronic components etc. b. Ultrasound is used to detect cracks and flaws in metal blocks. Such as aeroplane wings can be checked for cracks that would be invisible on the surface. d. Detection of developmental/ structural abnormalities in the fetus. Evaluation of the heart and diagnosis of cardiac problems. This technique is called ‘Echocardiography’. 25. Ultrasound is also used to break small ‘stones’ formed in the kidneys into fine grains.25. Explain how ultrasound waves are used to detect a flaw in an object? Answer: The ultrasound waves are allowed to pass through metal block to which are fitted detectors to detect the waves. Ultrasounds can be used to detect minor cracks or flaws in metal block. For this, ultrasonic waves are allowed to pass through metal blocks and detectors are used to detect the transmitted waves. If there is a crack in metal block, these waves get reflected back, thus indicating the presence of defects or flaws like cracks in the metal block. 27. Give the full form of SONAR. 28. Name the technique used to measure the depth of a sea. 29. How will you determine the depth of a sea using SONAR? Answer: ONAR is an acronym for Sound Navigation And Ranging. It is an acoustic device used to measure the depth, direction, and speed of under-water objects such as submarines and ship wrecks with the help of ultrasounds. It is also used to measure the depth of seas and oceans. The distance ( d ) of the under-water object is calculated from the time ( t ) taken by the echo to return with speed ( v ) is given by 2d = v × t .
This method of measuring distance is also known as ‘ echo-ranging’. 30. How do the bats fly in dark? Answer: Bats fly in the darkness of night without colliding with other objects by this method called echolocation. Bats emit high-frequency ultrasonic squeaks while flying & listen to the echoes produced by the reflection of their squeaks from the objects ( or obstacles ) in their path. From the time taken by the echo to be heard, bats can judge the distance of the object (or obstacle) in their path and hence avoid it by changing the direction. Notes: Bats search their prey at night by this method only.This happens as follows : Bats emit high-frequency ultrasonic squeaks while flying & listen to the echoes produced by the reflection of their squeaks from the prey like a flying insect.From the time taken by the echo to be heard, bats can judge the distance of the insect & hence can catch it. 31. How RADAR is different from SONAR? 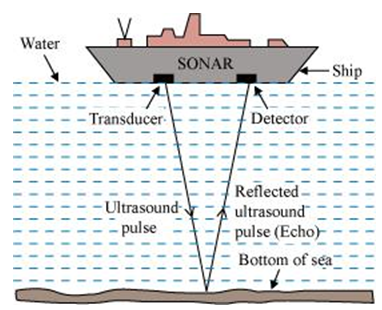 Answer: SONAR (Sound Navigation and Ranging) uses sound wave which is mechanical energy to "look" through water or other media, and RADAR (Radio Direction and Ranging) uses electromagnetic radiation(radio waves) to "look" through the air or other media. RADAR signals are mostly used for ground or atmospheric observations whereas SONAR signals are ideal for navigation and measurement under water. 32. Explain the function of ear by explaining its each part? Answer: The outer ear is called ‘pinna’ collects the sound from the surroundings. The collected sound passes through the auditory canal . At the end of the auditory canal there is a thin membrane called the ear drum or tympanic membrane. When a compression of the medium reaches the eardrum the pressure on the outside of the membrane increases and forces the eardrum inward. Similarly, the eardrum moves outward when a rarefaction reaches it. In this way the eardrum vibrates. The vibrations are amplified several times by three bones (the hammer, anvil and stirrup) in the middle ear. The middle ear transmits the amplified pressure variations received from the sound wave to the inner ear. In the inner ear, the pressure variations are turned into electrical signals by the cochlea. These electrical signals are sent to the brain via the auditory nerve, and the brain interprets them as sound. Note: The stirrup bone of the middle ear is the smallest bone in human body. 33. Distinguish between loudness and intensity of sound. Answer: Intensity depends on the energy per unit area of the wave and it is independent of the response of the ear, but the loudness depends on energy as well as on the response of the ear. 34. Why are ceilings of concert halls curved? Answer: The ceilings of concert hall are curved, so that sound after reflection from it reaches all the corners of the hall, and hence, is audible to everyone in the hall. 35. The frequency of a source of sound is 100 Hz. How many times does it vibrate in a minute? ∴ Number of vibrations produced in 1 minute (60 s) = 100 × 60 = 6000. (i) In stethoscope the sound of patient’s heartbeat reaches the doctor’s ears by multiple reflections in the tubes. (ii) Megaphones are designed to send sound waves in particular direction are based on the reflection of sound. 37. Why are longitudinal waves called pressure waves? Answer: Sound waves travels in the form of compression and rarefactions, which involve change in pressure, and volume of the air. Thus they are called pressure waves. Answer: harmonics are notes of frequency which integral multiple of the fundamental frequency produced by a device. For e.g. third harmonic is 3 times the fundamental frequency. 39. What are fundamental note and overtones? Answer: When a sound is produced, there are tones of different frequencies. The tone of lowest frequency is called fundamental note and the tones of higher frequency are called overtones. Q.40 Sound travels faster on a rainy day than on a dry day. Why? Answer: Sound travels faster on rainy day because the velocity of sound increases with increase in humidity. On rainy day humidity is more thus velocity of sound is aso more. Q.41 Why are the window panes of houses sometimes cracked when a bomb explodes even at large distance? Answer: The windows breaks because of the generation of shock waves in the explosion. Q42 If the tension in the wire is increased four times how will the velocity of wave in a string varies? Answer: velocity of the wave in string is directly proportional to the square root of the tension thus if tension is increased 4 times the velocity will be doubled.